The MAC 1911 Bullseye is a 45 ACP single action with barrel length of 6" and overall length of 9.88". Height is 5.56" with the weight of 46.91 ounces. The frame is made of 4140 steel; slide is made of 4140 hammer forged steel with wide rear serrations. It comes with fully adjustable Bomar-type rear sight and dovetail fiber optic front sight. The 1911 Bullseye has a flared and lowered ejection port, standard slide stop, ambidextrous thumb safety and enhanced beavertail grip safety, skeletanized hammer, combat trigger, checkered front strap serration, and ramped match-grade bull barrel. 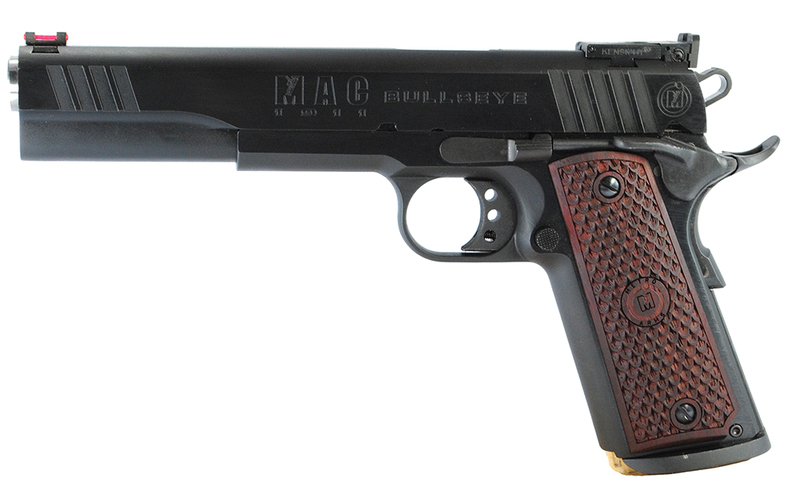 It comes finished in deep blue or hard chrome with custom hardwood grips with the MAC logo. Just got my 6" Bulleyes MAC 1911 back from its first range trip. Functioned beautifully EXCEPT for aluminum cased bullets (Blazer). I also used a variety of magazines - all worked with two exceptions ( R1 from Remington and 8 round Chip McCormick). I had read that it was very picky about magazines but just to be sure the readers are clear, here is a list of the ones that operated without any problems: Colt, ACT-Mag) Kimber, Ruger,generic military surplus and 10 round Chip McCormick. I fired consistent groups of 2-3 inches at 15 yards from a bench rest. Used 230 grain round nose Mag Tech, 185 Grain flat nose Winchester and 200 grain TAP FPD from Hornady. I fired 300 rounds on this first trip and the only function problems encountered was the aluminum jacketed bullets from CCI Blazer. I think it was just a powder/power issue because the slide would just not cycle properly. This gun is not only a beauty to look at, it is a great shooter, I fully expect for it to improve even more as it gets some wear on it. I own 12 1911 of different makes and this is as good as any of them...my next purchase(it is in layaway now) will be a 5" Kimber Custom Crimson Trace and the Magnum Research "Desert Eagle". I will be back with a report on these.